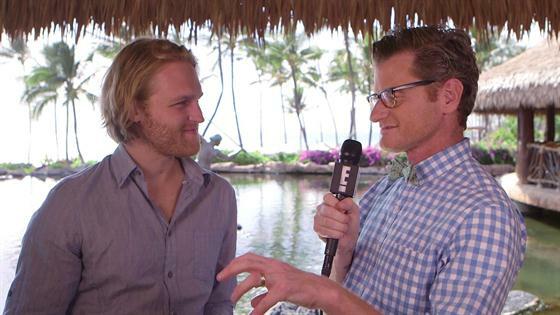 Maybe you don't know Wyatt Russell too well, but you will. He's Goldie Hawn and Kurt Russell's 29-year-old son and Kate Hudson and Oliver Hudson's half-brother. And he's also an actor—but he's pretty new to the business. He began acting after an injury ended his career as a professional hockey player. I caught up with Wyatt at the Maui Film Festival, where he received a Rising Star Award alongside fellow newcomer Kelly Rohrbach. "When I decided to go into acting I was like let me go in full force, do it like I did hockey," he said. "I don't know how else to do anything...I learned so much about it very quickly." But, he admitted about the craft, "I learned to love it... I fell in love with it after I began." Wyatt is also a musician. He did his own singing and guitar playing in the indie comedy Folk Hero & Funny Guy. "We did everything live," he said. "I've always loved music. It's been a big part of my life. The guitar, anything with strings. That's a large part of who I am as well. I sort of kept it in the basement for a long time when I was playing hockey." Like Goldie and Kurt did while filming Swing Shift in 1983, Wyatt found love on set. By his side in Maui was his actress girlfriend Meredith Hagner, who he met while they were shooting Folk Hero & Funny Guy together. The two couldn't be cuter hanging with Goldie during the festival's opening night festivities at the Grand Wailea resort. "You can bond over certain things and you understand each other in certain ways," Wyatt said of on-set romances. "Hopefully that can transcend other parts of life when you get off set...I think for us it does." And now make sure to click the video below to see exclusive behind-the-scenes footage of Wyatt from his breakout film Everybody Wants Some!! The Richard Linklater-directed movie is available on Digital HD tomorrow June 21 and on Blu-ray, DVD and On Demand on July 12.